The Golden Oldies Mission is a fully supported mission trip to Fiji. The team are based in Suva for the majority of the mission. We are planning to run a similar programme to last year, but details are still being discussed at present. Here is our 2018 itinerary for your information. 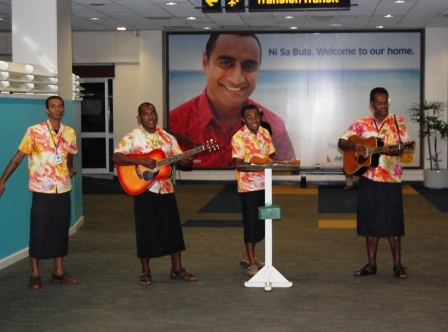 Saturday The team travel from either Auckland or Christchurch to Nadi, Fiji on Saturday afternoon. In the evening the combined team fly from Nadi to Suva, then travel into Suva city to the St Johns Bible College. The team is based at the Bible College for the next 8-nights. The team will attend the Suva Anglican Cathedral for the morning service. With most shops are closed for the day on Sunday. However, the buses still run and the team will this afternoon visit the home of ‘the chicken boy’ and be inspired about this amazing ministry to care for a young man who grew up being housed as a chicken. This evening a team meeting will take place to prepare for the week ahead. After breakfast each morning before the team head out on mission a Team Devotions time is held. Today a Fiji Cultural session will take place followed by a talk from the team of the House of Sarah Ministry. This ministry specialise in woman’s abuse issues and how the church is dealing with these challenges throughout Fiji and the wider Pacific. Tonight, the team visit a squatter village up in the hills on the outskirts of Suva city. This village is where the team from previous years has supported the purchase of a Woman’s fishing boat too. Tuesday The team travel to visit the oldest church on the Island and hear about how this small congregation support ministries in a local town. Then a short walk through the town to the local Medical Centre and Hospital. The Golden Oldies have supported this over-stretched and sparsely-resourced hospital with donated medical equipment from donations received. This afternoon the team travel to an orphanage, where we will meet the sisters, children, and volunteer supporters. The team will have time to talk with the children and experience life here in the orphanage. Wednesday Today we will visit squatter settlements in the region. The team will learn about the land tenure issues, squalor housing, subsistence farming, fishing and woman’s entrepreneurial micro-businesses. The team then travel to the ‘Tin Cathedral’ -a term given to a squatter village’s ‘Cathedral’ that was built in a week! It’s a great story, and recently with Overseas Aid, this village has just completed building a new multi-purpose church/community centre which the team will see for the first time this year. We then travel to visit the Government-run Old People’s Home, located in the WW2 Army Barracks. This is an inspiration visit with elderly people with physical disabilities like amputees, blind or deaf, co-habiting with those with mental health issues and dementia. The staff here are incredibly gracious, and again the Golden Oldies donate medical equipment to support them in their work here. Tonight we are hosted by a local youth group and join them in an evening of Praise and Worship. Thursday Today we travel to the Anglican School that has specialised in offering second-chance education for some young adults who want to return to school. Young men and single-Mum’s attend, and the school has grown from 80 to 350 students over the past 5-years. The team will spend the school day here with the children in either the pre-school, primary or secondary divisions on the school. Tonight, we are hosted by a suburban squatter village. They provide a cultural extravaganza with their food, music, and Fijian dancing. It’s a totally different style of squatter village to what the team experienced earlier on in the week, with different set of challenges. Adjacent to this village is the development of a new housing subdivision and the treat of expulsion from land they have lived on for generations is a constant threat they face. The Golden Oldies team are venturing to a remote fishing village at the mouth of the largest river system in Suva. It involves travelling in narrow elongated Fijian long boats down the river, through the mangroves to the ocean. Here we will spend the day with the village community and their Primary School and Kindergarten. The team will be allocated classrooms to spend time with the children, and the children will perform some traditional dances and songs as well. We will then visit a small hospital with 16 beds, catering for a population of 80,000 people. An incredibly humbling experience. Saturday Today is the team’s final full day in Suva. It will be a chance for the team to explore and experience the wonderful and famous Saturday Suva markets. Village people travel to the city with all their crops, poultry, fish, and crafts to sell on the Saturday. Suva is a bustling city centre and it’s a last chance to do some final shopping. Tonight, the Bible College and Golden Oldies will host a Thanksgiving Service and banquet dinner to thank the many people who have been involved in the mission over the past week. Sunday Today its pack up, saying our farewells, and travelling to Nadi. The team travel the Coastal Coral Pacific Highway that passes through many coastal and inland villages along the way. The team stops at a village church for a Sunday Service and village-hosted luncheon. Leaving here, we travel to Sigatoka. In partnership, a Kindergarten Ministry has been developed using the church as its base during the week. From 5-years ago, with a Parish of 3, the Church is now recognised as having the most successful pre-school programme in the region, with a waiting list for children to attend. It has also increased the numbers attending the church on Sundays. The team then complete the trip to Nadi. Here in Nadi the team will stay for their final 2-nights at a resort. Monday A day to relax and reflect on the mission. Some of the team will relax quietly at the resort or explore the local region, while others will venture out on a day trip to a tropical island to experience something of the beauty of the tourist region. A final night together as a team, before an early start the next morning. Tuesday Up and away to catch our flights back to NZ!